London, United Kingdom – Journalists, lawyers, activists and academics have warned that the arrest of Julian Assange could have grave consequences for press freedom if it results in the media’s ability to expose government wrongdoings being limited. The 47-year-old founder of the whistleblowing website WikiLeaks, an Australian citizen, was arrested by British police on Thursday at the Ecuadorian embassy in London, after the South American country revoked his asylum status. Assange had been locked up inside the embassy since 2012, when he sought refuge there while facing allegations of sexual assault in Sweden. He feared not receiving a fair trial and claimed that the charges were linked to his publishing activities with WikiLeaks. Assange appeared before a judge on Thursday and was found guilty of breaching bail conditions in 2012. Police said Assange was then “further arrested on behalf of the United States authorities” under an extradition warrant. The US has attempted to portray the case as a security issue. 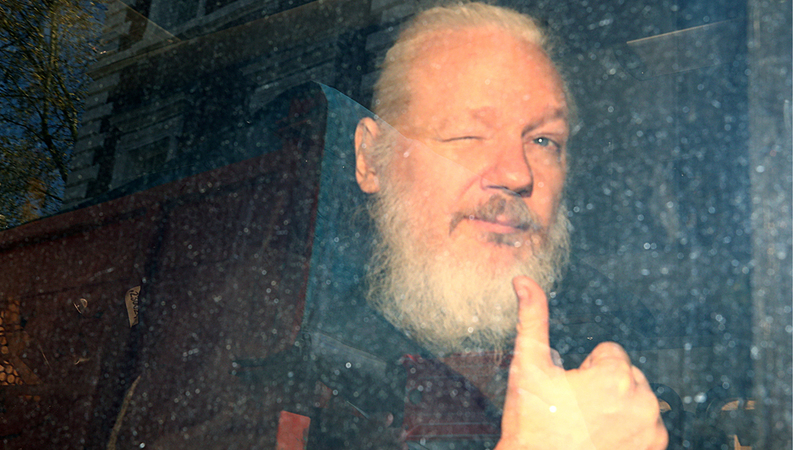 Assange’s extradition hearing will take place in London on May 2. In 2010, WikiLeaks released a number of classified documents on the Iraq and Afghanistan wars, exposing US war crimes. The site worked with media outlets – including Al Jazeera – to disseminate the information. The pursuit of Assange by the American government sends a very clear message to anyone who is looking at leaking documents that they will also be pursued. The trove included a well-known video showing two Apache US military helicopters target a group of people in Iraq in 2007, resulting in the killing of more than 23 people including two Reuters journalists. Former US intelligence analyst Chelsea Manning was found guilty of espionage for the leaks. She spent seven years in prison and was released in 2017 after her 35-year sentence was commuted by President Barack Obama. But during the US presidential campaign in 2016, when WikiLeaks published hundreds of internal emails that damaged the Democratic candidate Hillary Clinton, Assange was accused of being a stooge of a Russian government’s attempt to interfere in the elections. Assange’s critics credit him with helping Donald Trump clinch power. But the indictment, dated March 6, 2018, and unsealed on Thursday, has nothing to do with those allegations. An investigation by the US Department of Justice never found enough evidence to show that Assange knowingly worked with Russian intelligence to prop up the Trump campaign. Instead, it accuses Assange of helping Manning crack a password to log into the defence department’s computer database with a username other than her own. It does not explicitly charge Assange for publication, but accuses him of “conspiring” with Manning to obtain the classified documents. “It was part of the conspiracy that Assange encouraged Manning to provide information and records from departments and agencies of the United States,” the indictment reads. While the indictment skirts the issue of press freedom by charging Assange with computer fraud, rather than publishing crimes, journalists and press freedom advocates have expressed concern about the allegations of “collusion”. They argue that it is part and parcel of a journalist’s job to encourage sources to provide more information if it is deemed to be in public interest. “The potential implications for press freedom of this allegation of conspiracy between publisher and source are deeply troubling,” said Robert Mahoney, deputy director of the New York-based Committee to Protect Journalists (CPJ). “With this prosecution of Julian Assange, the US government could set out broad legal arguments about journalists soliciting information or interacting with sources that could have chilling consequences for investigative reporting and the publication of information of public interest,” Mahoney added. Freedom of the Press Foundation executive director Trevor Timm pointed out that “requesting more documents from a source, using an encrypted chat messenger, or trying to keep a source’s identity anonymous are not crimes; they are vital to the journalistic process”. The Obama administration’s attempts to prosecute Assange floundered out of concern that doing so would impinge First Amendment rights. But the Trump cohort has been more outspoken, particularly after WikiLeaks began publishing secret CIA surveillance and cyber warfare tools in the series of documents known as Vault 7 in 2017. The UK’s National Union of Journalists (NUJ) condemned the UK government’s cooperation with the US in the extradition case. “The UK should not be acting on behalf of the Trump administration in this case,” said the NUJ’s assistant general secretary Seamus Dooley, adding that “the manner in which Assange is treated will be of great significance to the practice of journalism”. WikiLeaks has come under fire in the past for publishing unedited information that includes the sensitive personal details of civilians or activists. “When I dealt with WikiLeaks output, we very carefully went through everything that we were offered and checked that everything was in the public interest,” Meirion Jones, an editor at the London-based Bureau of Investigative Journalism, told Al Jazeera. Assange is perhaps the worst poster boy for press freedom given his activities. But we still have to recognise [the] issue of press freedom, even if it is Julian Assange in this case. At the time of the Iraq and Afghanistan leaks, Jones was working for the BBC. Assange remains a polarising figure. His supporters defend him as a persecuted journalist as detractors point to a political agenda behind his latest activities. Meanwhile, journalists around the world continue to be killed, imprisoned and intimidated, often at the hands of governments. The killing of Saudi journalist Jamal Khashoggi at the country’s Turkish embassy is among the recent high-profile cases. In Europe, investigative journalist Jan Kuciak and his fiancee Martina Kusnirova were murdered in Slovakia last year, sparking protests against state corruption. Maltese journalist Daphne Caruana Galizia’s was murdered in 2017 while investigating government corruption. “Politically, the way the Americans are trying to get Assange and therefore to go after other whistleblowers is something we need to be conscious of,” Scott Lucas, an international politics professor at the University of Birmingham, told Al Jazeera. American Airlines 737 Max planes will remain grounded until at least Aug. 19.